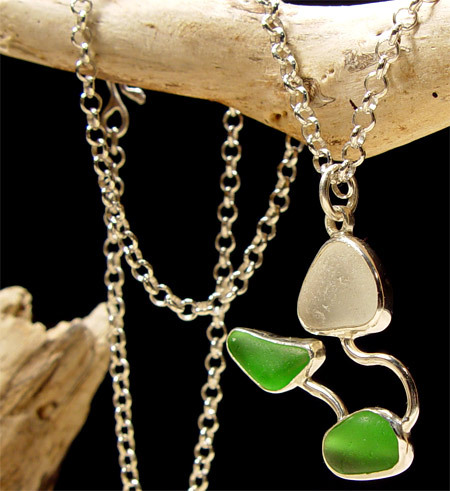 This sterling silver pendant features a mix sea glass found in the Santa Cruz California area. One white piece, two green pieces. All with a smooth textures created by the ocean. Set in a bands of sterling silver connected with formed sterling silver wire. The sterling silver bezels allows luminescence the sea glass. Sterling silver chain is included. This sea glass pendant measures 1-3/8" length x 1-3/8 " wide x 1/4" thick.